ExaGear Strategies is a Windows environment emulator for android which allows launching PC game on Android devices. 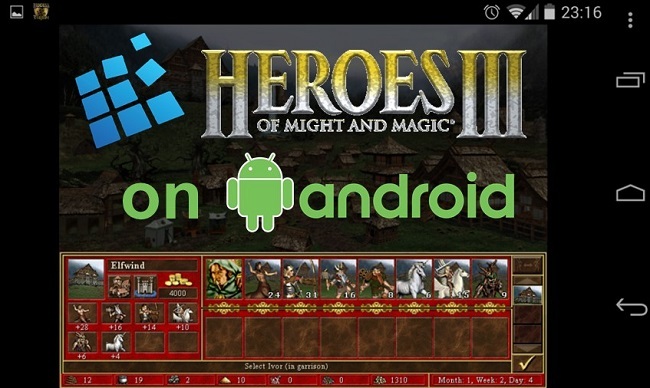 The application also offers special controls adapted for PC strategy games to be played on the mobile touchscreens. ExaGear Strategies runs PC games without the Internet and without streaming, which means that the ga,e runs natively and absolutely without notable performance loss. This works like that because the app utilizes a unique porting technology which creates Windows environment inside Android. The game is functioning inside this made-up environment natively and independently. in the root of the internal SD card of your Android device. Installation folder of the game is the one containing game’s executable file. This folder is normally found under C:\Program Files (x86). If you have a version of the game that requires a game CD to be in the CD-drive when playing it, then please copy files from the game CD to your Android device to the folder where you have put the game. Lunch ExaGear Strategies and run your favorite game! If you'd like to find the app - just google for ExaGear Strategies (the original website occupies the first position, link to the app on Google Play - the second one). This thread is formed up for the discussion, complaints, offers, questions and (partially) for the reasonable support. Please, comment on what games would you like to be tested and fixed and what feature you feel should be added.